Up Close Photography brings into focus exceptional moments, people and animals in your life. Our established team consists of Award Winning Professional Wedding and Equestrian photographers who also specialise in Family, Portrait, Newborn, Baby, Pets, Events, Studio, Commercial and Modelling portfolios. As well as the quality of our work making Up Close Photography so successful, it's also our fantastic relationships we form with our clients, together with the passion, creativity and pride we place in creating personal and stylish photography. 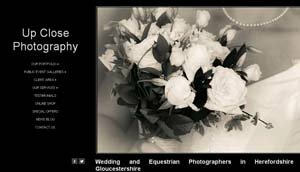 Up Close Photography team are based within the Gloucestershire and Herefordshire Borders and photograph locally, nationally and internationally.